Rio is not only a city of the present and the future but also a city with a past, an honourable past that has left reminders of its former glories in the narrow streets of downtown Rio, Centro, where Rio was born in 1565 and from where it has since grown and developed, and is now being redeveloped. Because of traffic and people congestion, the best way to discover the historic legacy of Rio is to walk. Before you set out make sure you dress appropriately; that means flat shoes if you want to survive on the somewhat uneven city sidewalks, and expect the city to be hotter than the beach. No shorts though, if you want to visit some of the many churches. The best time to walk about in downtown Rio is during the week. Plan your tour to start around 10am, this way you miss the worst of the rush hour and are able to split the walk by taking lunch somewhere along the route. 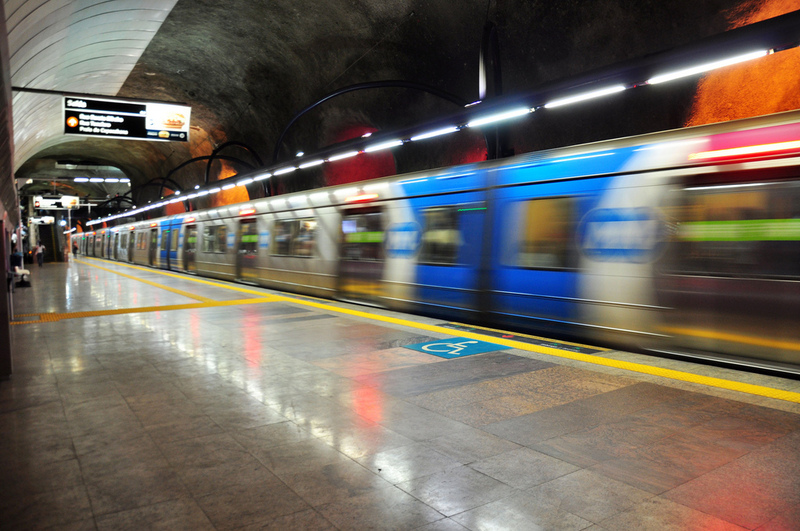 In Centro you are never very far from a metro station, and it is the quickest way to get from Copacabana and Ipanema to Centro. The walk will end at Cinelândia where one of the stations in located. Being downtown you will pass the Museum of Tomorrow, Museum of Rio Art, National Museum of Fine Arts, the Theatro Municipal and the Olympic pyre, while only being a short walk or cab ride away from the National History Museum, Itamaraty ,Palace, the Museum of the Republic, Modern Art Museum and the city’s new aquarium. Even Maracanã, a short metro ride, and the National Museum are not far away. 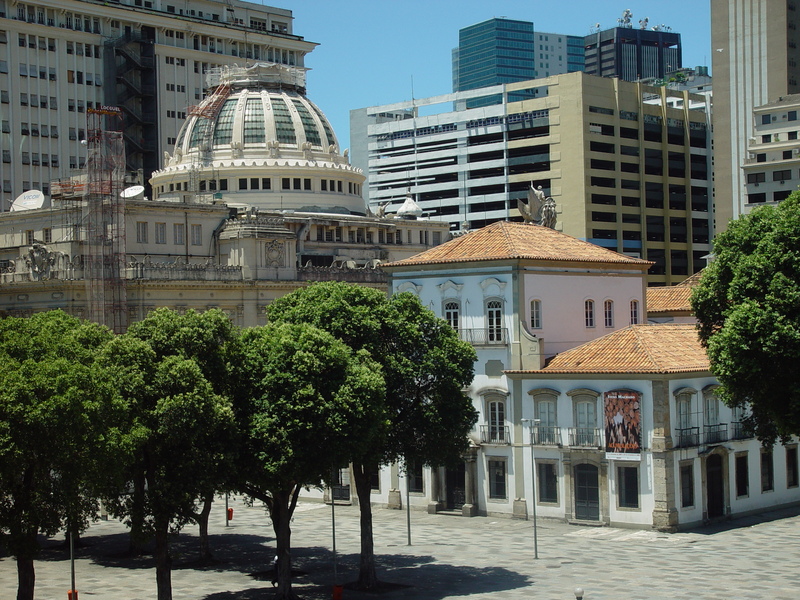 The main square of Praça XV de Novembro, or Largo do Paço as was, is the historic heart of Rio and a good place to start any historic tour of downtown Rio.The nearest metro station is Carioca. It is only a short walk down either Rua da Assembleia or Rua Sete de Setembro to Praça XV. Within the square are a number of important historical buildings, the most important of which was the House of the Viceroy, a colonial style building constructed in 1743 that became the Royal and then the Imperial Palace (Paço Imperial) with the arrival of Dom João. The building served as the headquarters of the Post and Telegraphic Department from the proclamation of the republic in 1889 until the early 1980s. Today the building, which is open from noon to 6.30pm, but closed on Monday, hosts visiting art exhibits, the occasional erudite concert as well as a snack bar, restaurant and a number of stores. 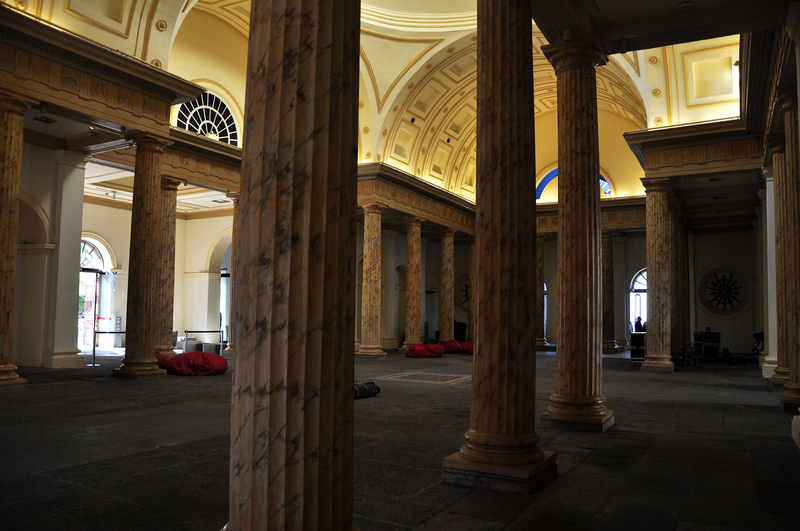 The building underwent an extensive restoration program at the end of the eighties that has restored the authentic visual outline that existed at the time when Dom João was in residence. From the central balcony, at the seaward end of the Palace, Dom Pedro I declared his intention on January 9, 1822, to stay in Brazil despite the demands of the Portuguese court, while, in 1888, Princess Isabel made the announcement of the abolition of slavery, an event which contributed to the downfall of the Brazilian monarchy. Close to the Imperial Palace, in the center of the seaward end of the square, is the Chafariz da Piramide that was originally used to supply water to ships berthed alongside the Praça. In 1808, if you had been standing by the Chafariz, you would have witnessed the arrival of Dom João VI of Portugal who had fled from Europe in the face of Napoleon’s advancing armies. Twenty–three years later, in 1831, Dom João’s son, Pedro I, would sail from the same spot on his way to take over the Portuguese throne, while, in 1889, Dom João’s grandson, Pedro II, would sail from Praça XV on his way to exile in Europe after Brazil had been declared a republic. Today the waterfront is home to the frequent ferry services to Niterói and Paquetá Island. 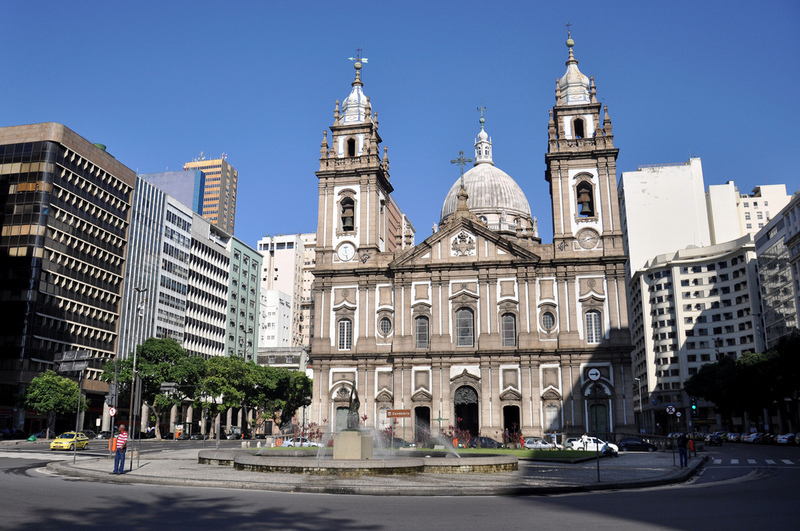 Also to be found in Praça XV, by crossing back over the busy Avenida Primeiro de Março, is the old Metropolitan Cathedral, built in 1761, which served as the Royal Chapel. The Coronation of Pedro I was held here on December 1, 1822. On the outside wall of the Cathedral is a plaque commemorating the first mass to be held in Rio. The date was March 1,1565. Next door to the old Cathedral is the rather prettier Church of the Carmo Convent, built in 1755. Leave Praça XV through the Arco do Telles (Telles Arch) located on the opposite side of the square to the Paço Imperial. The Arco do Telles dates back to the eighteenth century since when it has survived a major fire that destroyed the old Senate House that it linked to another similar building. The Arco do Telles leads into a tiny back street called Travessa do Comércio. Time has stood still here and the street is a quiet pedestrian precinct lined by the original houses, a number of which are pleasant restaurants. At night the area really comes alive, as people spill into the bars after work and the bars, in turn, spill on to the streets. Carmen Miranda lived as a young girl at number 13 and her mother owned a bar on the street. 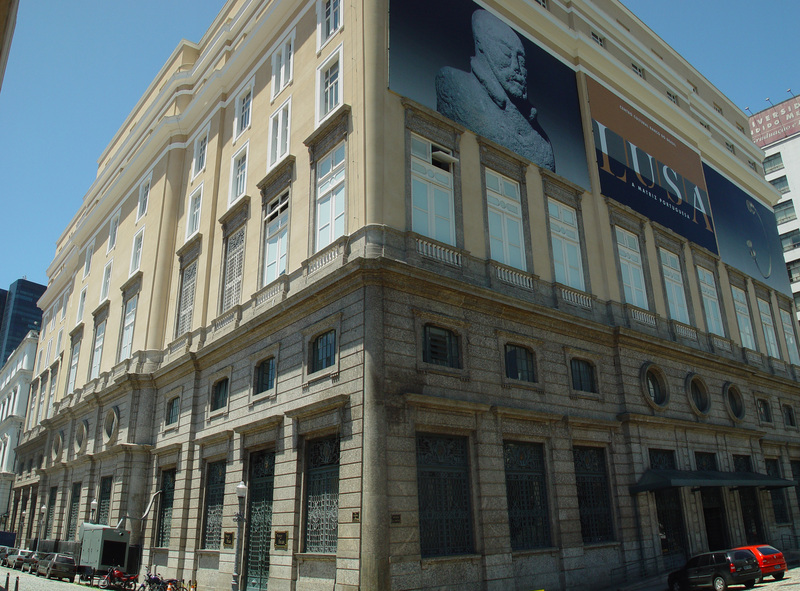 The first street crossed by Traverse do Comércio is Rua Ouvidor, one of the city’s most important commercial centers and home to many of the top international banks which dominate the street after it crosses Av. Primeiro de Março. 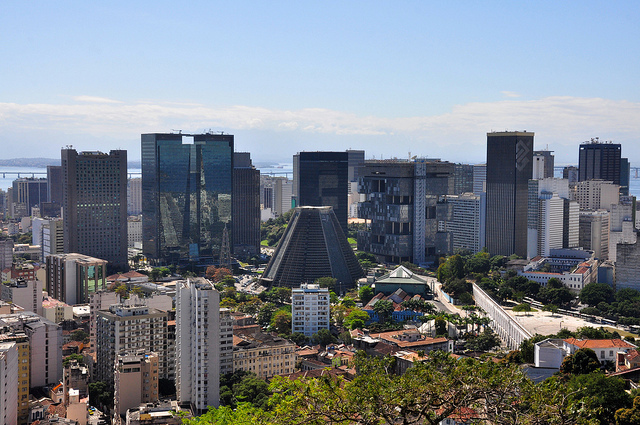 At one time, Ouvidor was considered to be the Wall Street of Brazil but with the dispersion of the banks between Rio, São Paulo, and Brasilia, that title is now better held by Avenida Paulista in São Paulo. Turning left from Travessa do Comércio into Rua Ouvidor you will find, immediately on your left, the minute Church of Our Lady of Merchants which, despite its size, or perhaps because of it, is worth a visit. The church dates from 1750. On the corner of Ouvidor and Primeiro de Março is the Church of the Sacred Cross of the Military, a building that dates back to 1811. The present church was pre–dated in the 17th century by a small fort – hence the military connection – which then sat on the seashore. Beyond the church are the Tribunal Regional Electoral, built in 1890, and one of the city’s main post offices. This area, from Praca XV down to Presidente Vargas, is today known as the cultural corridor for the many cultural centres that have sprung up since the 1990s. The entire final block of Primeiro de Março and Presidente Vargas, for example, is taken up by a magnificent building belonging to the Banco do Brasil, the country’s most important bank that was founded by Dom João in 1808. 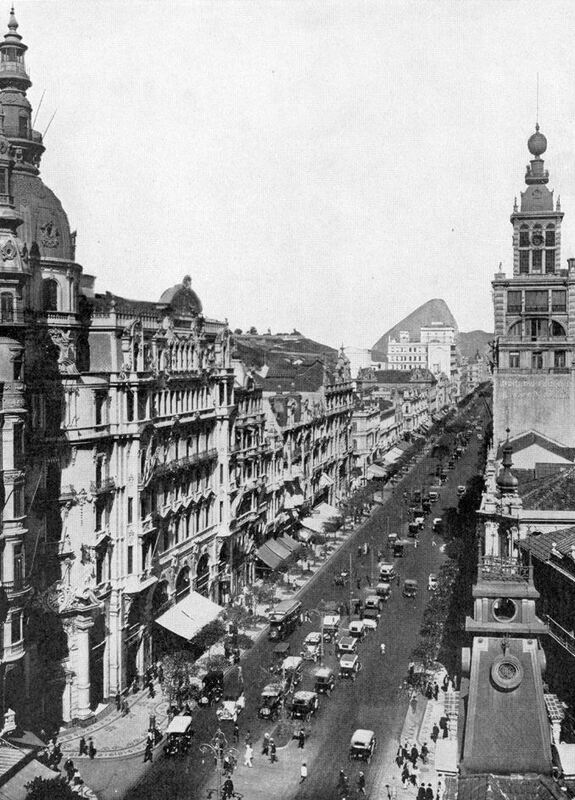 The greater part of the building was constructed between 1880 and 1906 and acted as the Commercial Association of Rio de Janeiro until the bank bought the building and moved in in 1923. 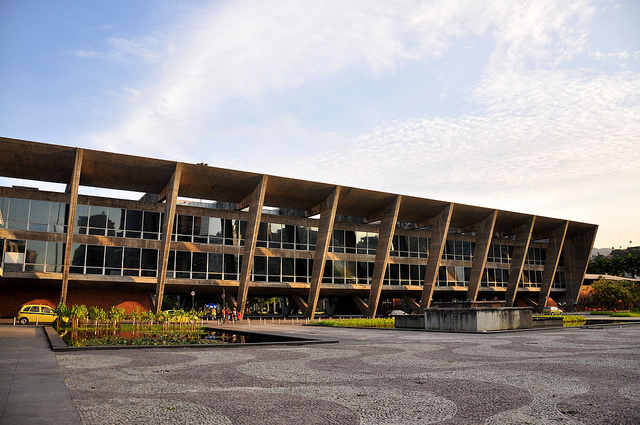 The building then acted as the headquarters of the Banco do Brasil until 1960 when it moved to Brasília. Over the next two decades the building remained the Rio headquarters of the bank until a decision was taken to turn the site into a cultural center. 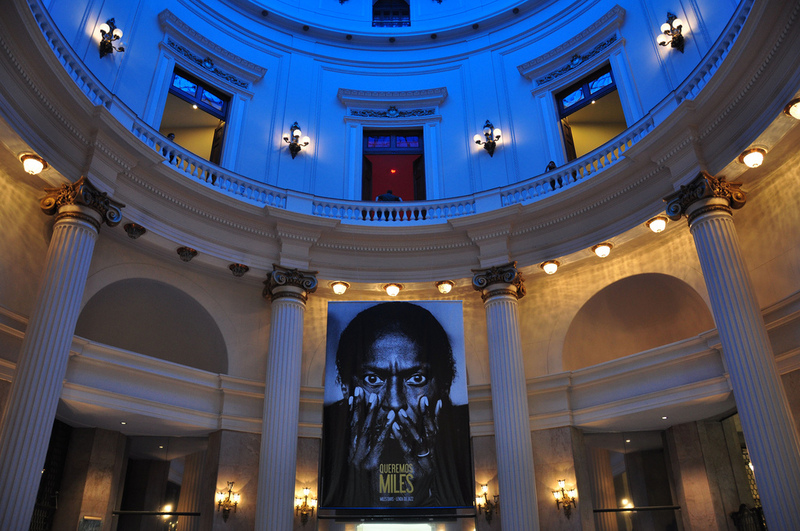 The Centro Cultural do Banco do Brasil (CCBB), which opened in September 1989, has had an enormous impact on downtown Rio and is now considered to be one of the country’s, if not Latin America’s, best run cultural centers. The center, which is open daily, except Tuesday, from 9.00am to 9.00pm, has its own theater, cinema, video club, as well as a space for an ever changing variety of exhibitions and a small museum that is dedicated to money in all its forms – a fitting topic for a building that is owned and run by a bank. Leaving the Center by the other door, nearest Presidente Vargas, you will find immediately to your right the Casa França–Brasil which is housed in the old customs house that dates from 1820. The aim of the center, which is open Tuesday through Sunday from 10am to 8pm, is to further cultural relations between Brazil and France, yet each exhibition also has the task of displaying the interior of the building at its best. Close by is the Centro Cultural dos Correio which is open Tuesday through Sunday from noon to 7pm. 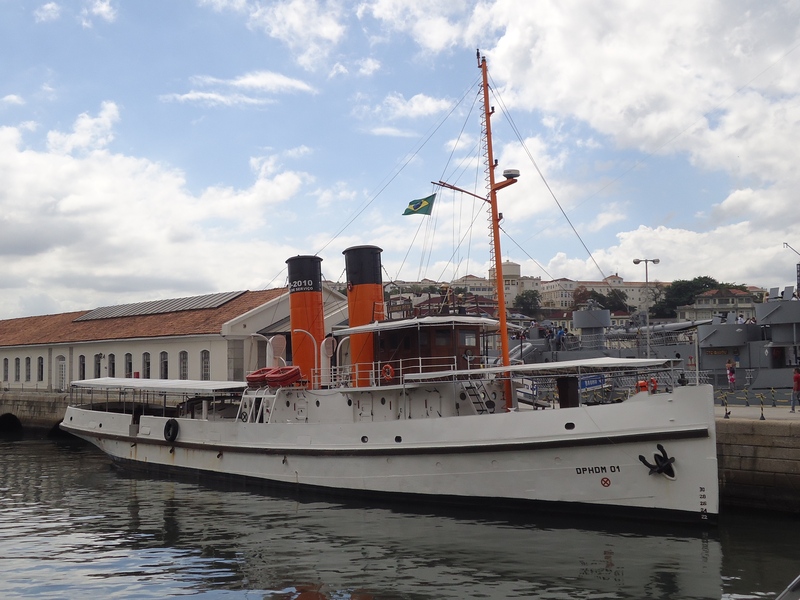 Behind the Casa França–Brasil is the Naval Cultural Centre (Espaço Cultural da Marinha) which is dedicated to the history of the Brazilian navy and navigation in general. From the seashore you will be able to see an unusually shaped island fortress in the bay. 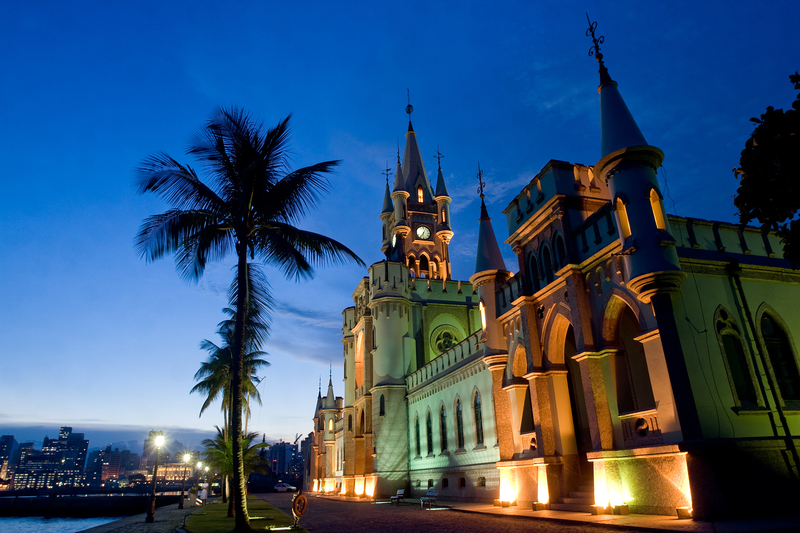 This is the Ilha Fiscal where, on February 19, 1889, Dom Pedro II attended his last ball as Emperor of Brazil. On November 15, 1889, the monarchy was overthrown and Brazil became a republic. Behind the Ilha Fiscal, in the distance, is the Rio–Niterói Bridge, or, to give it its official name, the Presidente Costa e Silva Bridge. The bridge is over nine–and–a–half miles (15,5 km) long, nearly 200 feet high at its highest point, and 90 feet wide. Over 10,000 workers and 60 engineers were involved in its construction. It is possible to cruise the bay from the Naval Cultural Centre on the Laurindo Pitta, a British tug built in 1910. The cruise, which takes place from Thursday to Sunday at 1.15pm and 3.15pm, includes visits to the Ilhas das Cobras and Ilha Villegaignon, as well as the Ilha Fiscal. From the Naval Cuiltural Centre you will be able to see the Church of N. S. da Candelária, one of Rio’s most noble churches, which is considered to be a landmark in its own right, sitting, as it does, in the center of Avenida Presidente Vargas, a road that was once the widest avenue in South America and for many years the setting for the famous Carnival parade of the Rio samba schools. You will also see the Olympic pyre. Rio had two. This one and one inside the Maracana Stadium. A church has stood on the site of N.S. da Candelária since 1705 although the present structure only dates from 1775 and the dome from 1877, rebuilt in 1894 after being hit by a stray cannon ball. The inside is magnificent. 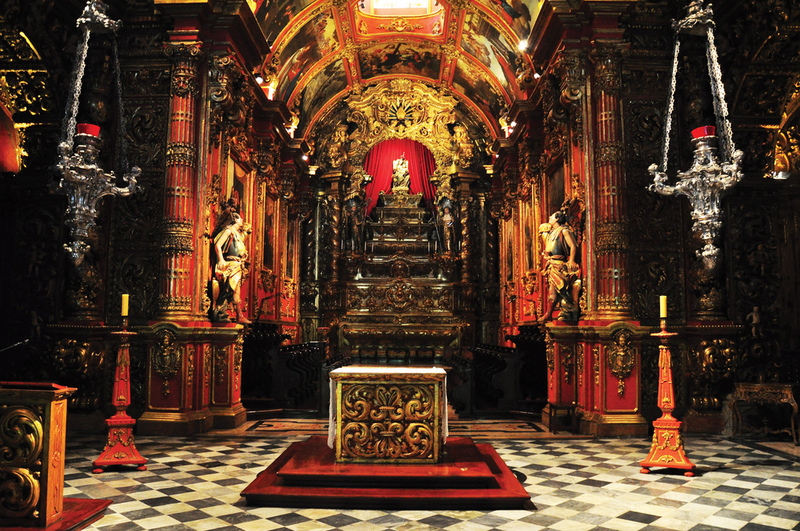 Candelária is open for viewing from 7.30am to noon and 1pm to 4pm during the week with Sunday Mass at 9, 10 and 11pm. From Candelária you should move on to yet another church, but not any old church as for many it is the most spectacular and beautiful in Rio. 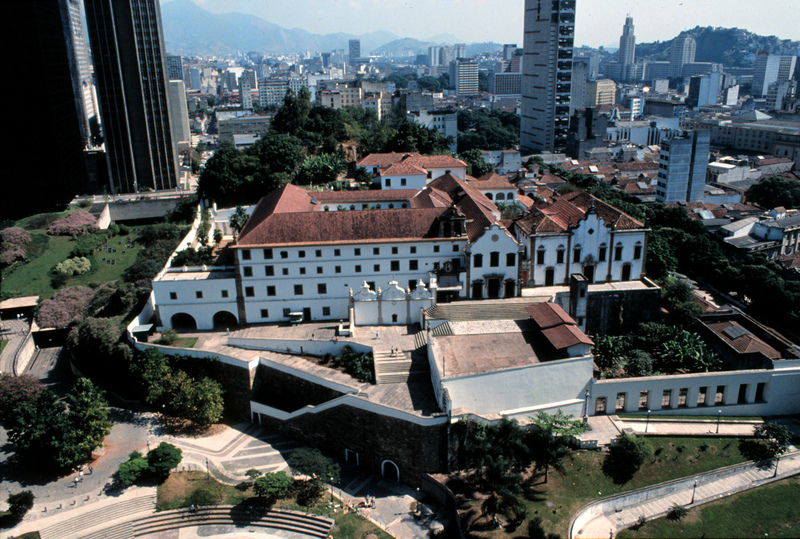 It is the São Bento Monastery, founded in 1589. To reach the Benedictine Monastery you must walk back towards the bay, away from Candelária, and take the second left, which is Rua Primeiro de Março. The monastery is situated in Rua Dom Gerardo that is the last road that breaks off to the left from Primeiro de Março. To reach the monastery from the road take the elevator located in number 40, Rua Dom Gerardo, and go to the top floor (5th). São Bento is one of the city’s most historic buildings and has remained structurally untouched since being built between 1617 and 1641. 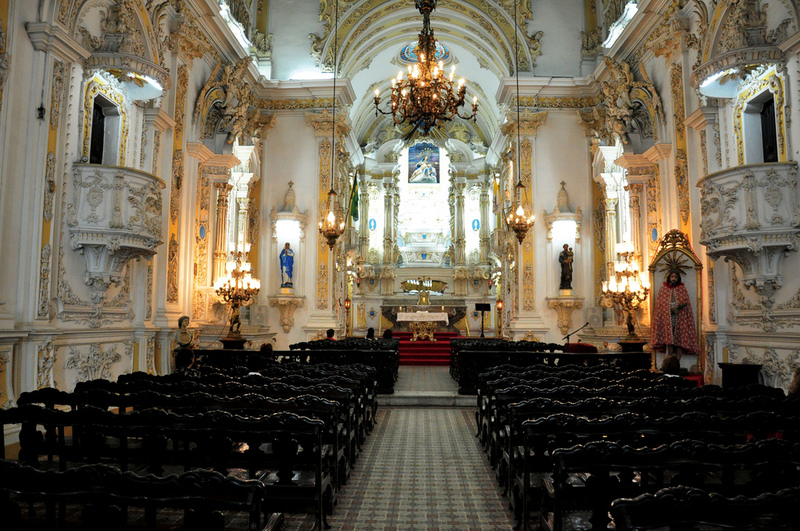 The inside is richly decorated and the monastery and grounds are a haven of tranquility in the hustle and bustle of downtown Rio. You may wish to return on Sunday to hear the Gregorian Chant at 10am. The monastery is open daily from 6.30am 6.30pm. Walking to the end of Rua Dom Gerardo brings you back to Avenida Rio Branco. To the right is Praça Mauá and the start of the docks and the area know as the Olympic Boulevard. The Touring Club do Brasil, in the corner of the square with the docks, is the building where visiting cruise ships berth. 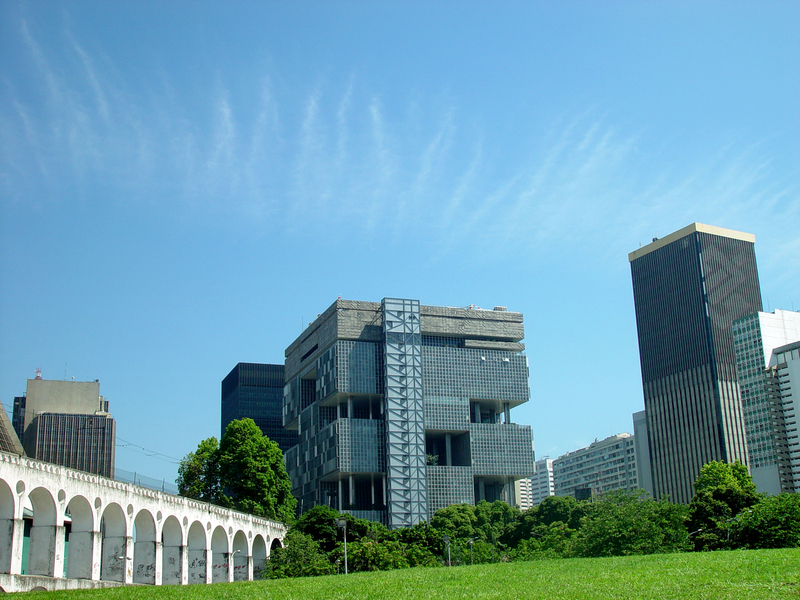 Praça Mauá is also home to the stunning Museu de Arte do Rio, which is a must for any visitor as the collection is purely art that is focussed on Rio de Janeiro. Many of the museums paintings will show you what the Rio you have just walked through looked like in the past. The museum is open Tuesday through Sunday from 10 am to 5 pm. Looking back down Avenida Rio Branco from Praça Mauá you should be able to see in the far distance the War Memorial that was positioned to be seen along the whole length of avenida. 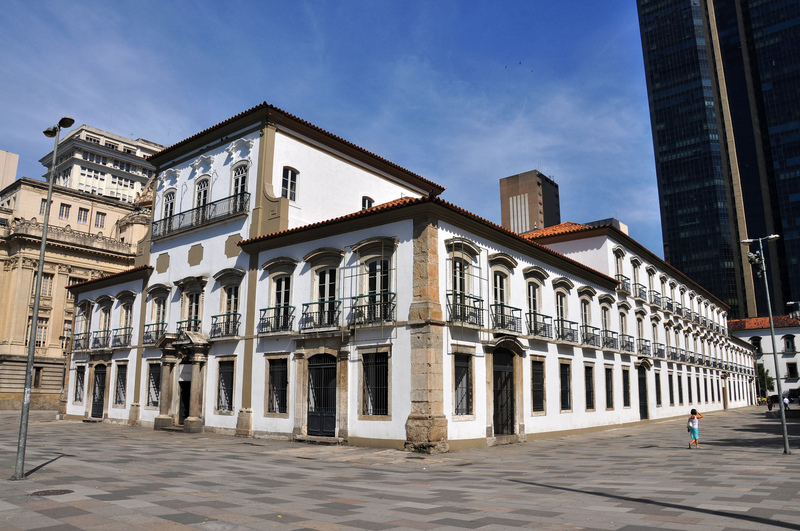 On the corner of Rua Visconde de Inhaúma you should make note of the old Brazilian Mint, Casa da Moeda. If you think the building, with its’ majestic balconies, would be more appropriate as a Presidential Palace, you would be right. 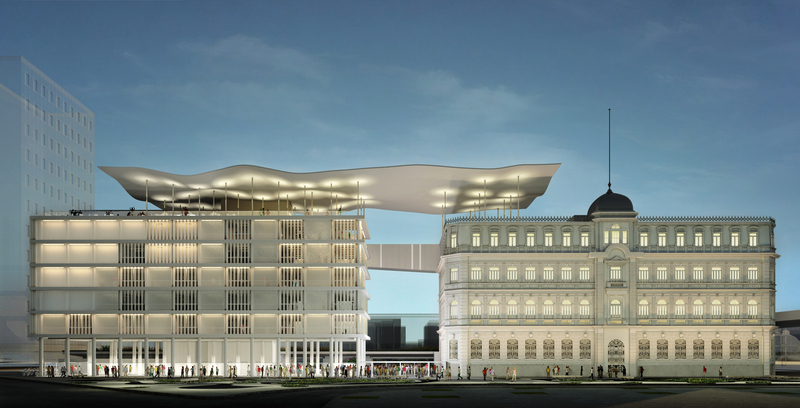 As the story goes, a French architect was commissioned to design the Brazilian Mint and the Presidential Palace in Santiago, Chile. At this stage Murphy’s Law came in to play and the plans got sent to the wrong cities. The result was that Rio ended up with a Presidential Palace as its Mint and Santiago, to this day, has a Mint, the Palacio de la Moneda, as its Presidential Palace. The story may not be true, but it is a good one. Avenida Rio Branco itself dates from 1904, when 590 buildings were demolished to make way for the new Central Avenue that was later so named Rio Branco in 1912, after the death of the country’s foreign minister, the Baron of Rio Branco. In its time, Rio Branco was considered to be more important than the beach and the ladies and young gentlemen “did the Avenue”. Crossing Presidente Vargas, Candelária will now be to your left, continue up Rio Branco on the right hand side. If you take the third right, Rua do Rosário, a pedestrian road, you will be in one of the main and most traditional shopping areas of Centro. By back tracking up Rua Uruguaiana you will come on your left, to the roads of Buenos Aires, Senhor dos Passos and Alfandega, the latter two being reserved for pedestrians only. These streets are packed with all sorts of wild and wonderful stores. By following any of these roads to the end you will come, in about seven blocks, to the Campo de Santana, one of the city’s more interesting parks. For a long time the Campo de Santana, where Deodoro da Fonseca proclaimed the Republic on November 15, 1889, was the inland edge of the city. Bullfights were held here until the 1840s and before that the public pillory was located in the park. 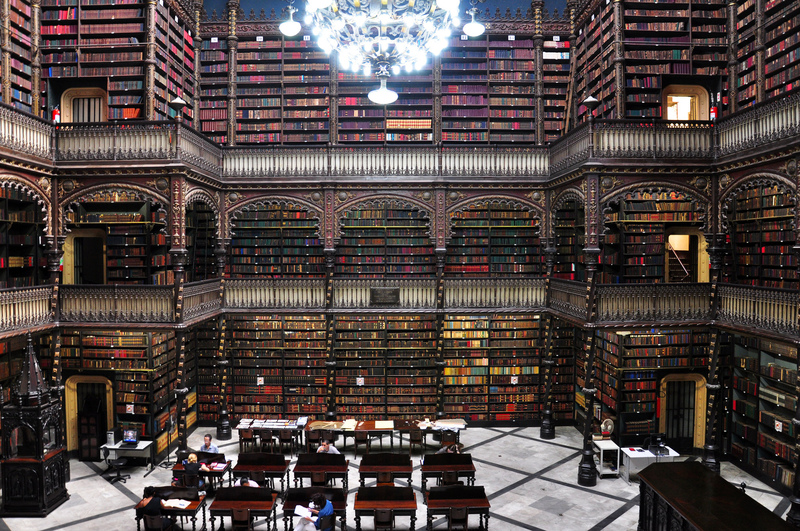 En route to Campo de Santana, a short detour up Rua da Conceição to Rua Luis de Camões, 30, will take you to the Real Gabinete Portugues de Leitura, one of the world most important Portuguese language libraries. Don’t worry about not speaking the language as the library itself is breathtaking. Open Monday to Friday from 9.0am to 6.00pm. If you don’t want such a lengthy detour, turn into Gonçalves Dias, away from the flower market. 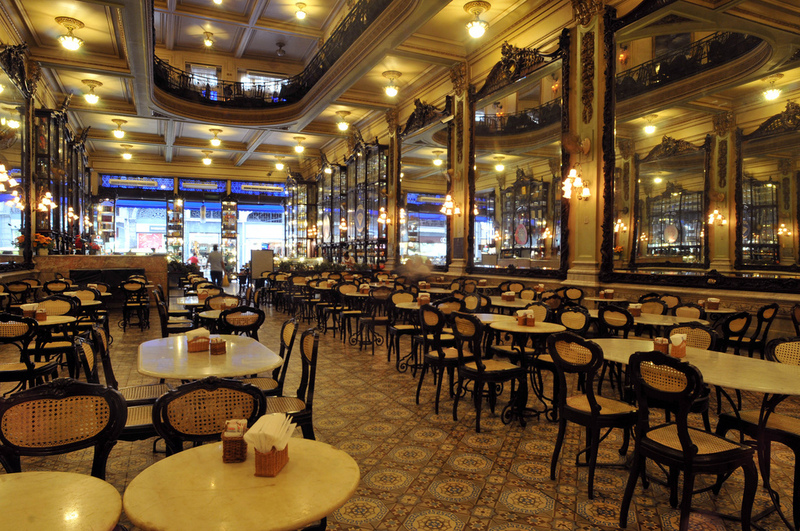 In the block between Ouvidor and Sete de Setembro you will find at number 32, Confeitaria Colombo that has been serving elegant lunches and teas since September 17, 1894 and is a landmark in its own right. Go inside, if only for a fruit juice from the counter. At the end of Gonçalves Dias is Largo da Carioca. Largo da Carioca has been an active part of the city since the early 17th century and today is the meeting place of the old and the new. The old sits sublimely on top of a low hill overlooking the square, represented by the Church and Convent of Saint Anthony, built between 1608 and 1620, and the richly decorated Church of Saint Francis that dates from the 18th century. In Largo da Carioca you will find a mass of traders and street performers who stretch all the way down the side of the Teatro Municipal to Praça Floriano and Cinelândia. 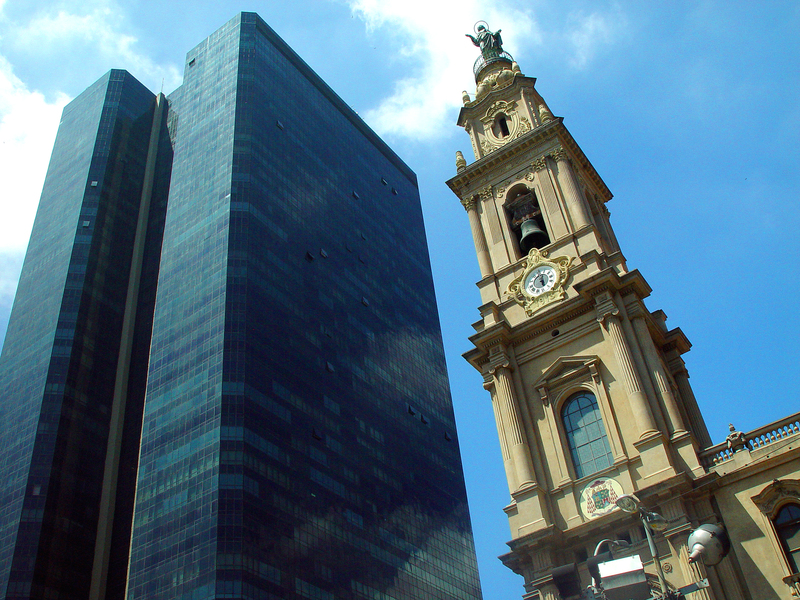 Walk away from Rio Branco and head across Avenida República do Chile, past the cubist, futuristic headquarters of Petrobrás, the state oil company, to the Metropolitan Cathedral. 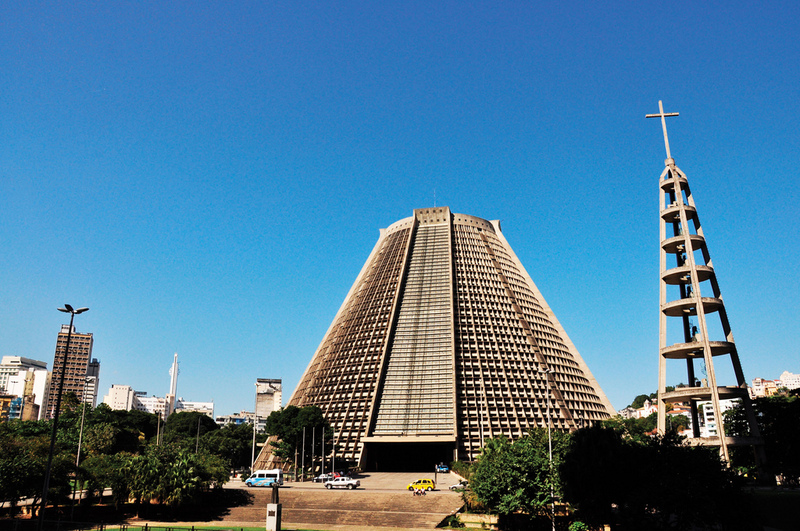 Still seemingly far from finished, the first stone was laid way back on January 20, 1964, the Cathedral was inaugurated on November 16, 1976, to celebrate the 300th anniversary of the Diocese of Rio. The Cathedral stands on a spot that used to be the hill of Saint Anthony. Today, all that remains is the small hill overlooking Largo da Carioca; the rest was excavated and used for the landfill that became Flamengo Park. For those who like statistics the Cathedral is 272 feet (83 meters) high externally and 223 feet (68 meters) internally with no internal columns to support the structure. The church has a diameter of 341 feet (104 meters) and a capacity for 5.000 sitting and 20.000 standing, a figure that was surpassed on August 2, 1980, when Pope John Paul II visited the Cathedral. 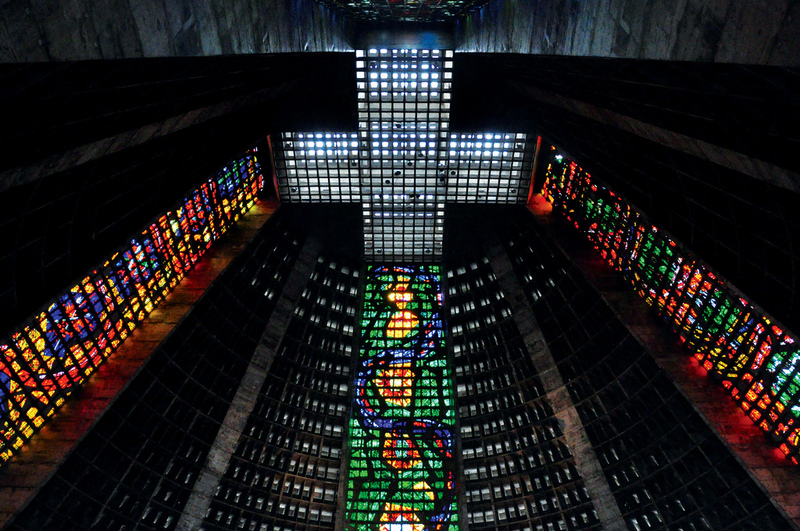 Four huge stained glass windows dominate the inside of the church, each measuring more than 65 by 197 feet (20 by 60 meters). Each window has a predominant color scheme and they represent the ecclesiastical (green), the saintly (red), the catholic (blue), and the apostolic (yellow). 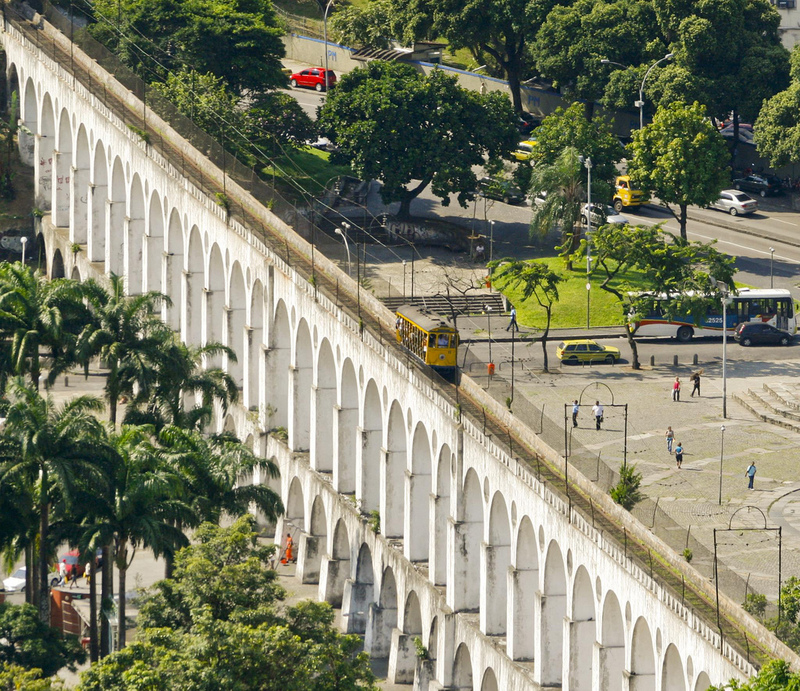 Take the Cathedral exit closest to Largo da Lapa and cross beneath the 36 arches that make up the Aqueduto da Carioca (Carioca Aqueduct), one of Rio’s best-known landmarks, popularly known as the Arcos. Work started on the aqueduct in 1724 and it was designed to bring fresh water from the Santa Teresa forest down to the public fountain in Largo da Carioca. In 1896 the arches became the base for the viaduct which links the Santa Teresa streetcars with the city center, a service that still runs today. The station is located behind the Petrobrás building. 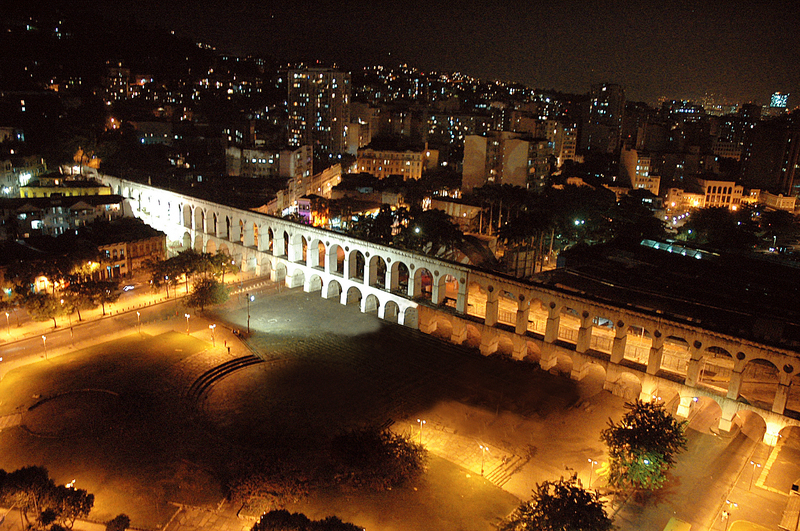 The aqueduct, and the surrounding areas of Lapa, makes an interesting backdrop for photographers. In one direction you have the aqueduct and behind it the futuristic Cathedral and Petrobrás headquarters, backed by some of the city’s tallest skyscrapers, while in the other direction you have the original houses, dating back to the last century, that have been painstakingly restored in their original colors. At the turn of the century this area and Lapa, which stretches away beyond the arches, were the center of Rio’s nightlife, when it was full of bars, cabarets and clubs. Today life has returned to the area and there is a thriving and exciting scene including many bars with live music and dancing. If you are a classical music fan you may also find yourself coming to the Largo da Lapa to hear recitals at the Sala Cecília Meirelles or Escola da Musica (Music School). Taking the road opposite the Sala Cecília Meirelles, Rua do Passeio, you pass on your right the Passeio Público, the city’s oldest park, landscaped in 1789. The sea used to come up to the far wall of the park that could only be reached by boat. On the left you have the Escola da Musica, Touring Club and cinemas. If you follow Rua do Passeio along you will come again to Rio Branco and the area known as Cinelândia, named after the movie houses that were built here in the 1930s. In front of you, you will see the magnificent Teatro Municipal built in 1905 and modeled on the Opera Charles Garnier in Paris. At the time of its construction it was Rio’s most luxurious and extravagant building, and almost the most costly. 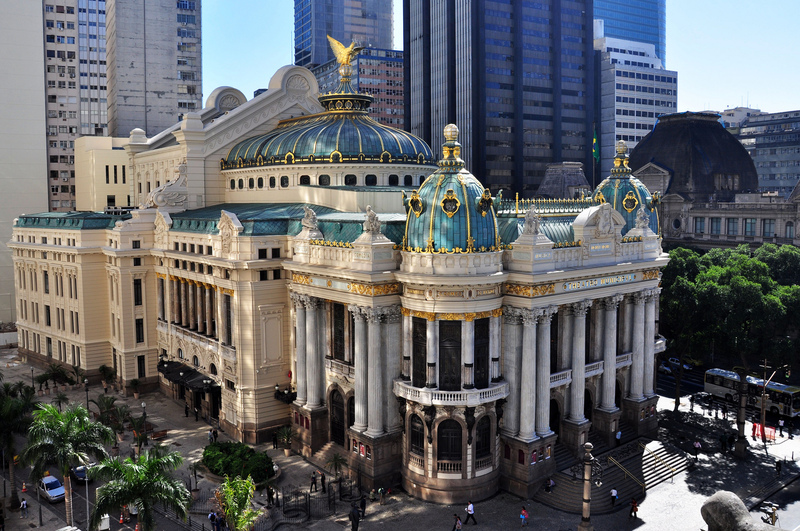 Inaugurated on July 14, 1909, the Theatro Municipal remains today the center of Rio’s cultural activities. Among the artists to grace its stage have been Sarah Bernhard, Maria Callas, Nijinsky, Anna Pavlova, Caruso, Arthur Rubinstein, Igor Stravinsky, Leonard Bernstein, Luciano Pavarotti and Oscar Peterson. Tours of the theater are infrequent, so treat yourself to returning in the evening to enjoy one of the theater’s many presentations. 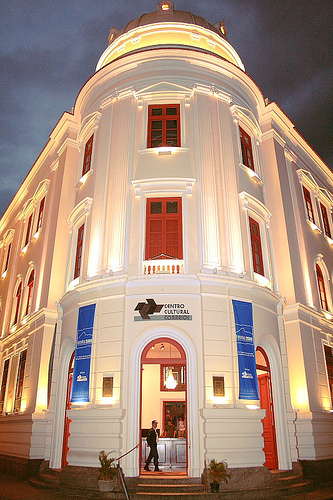 On the opposite side of Rio Branco to the Theatro Municipal is the National Museum of Fine Arts (Museu Nacional de Belas Artes), on of Rio’s most important art collections. You can now return by metro back to your hotel from the station in Cinelândia but, If you still have the stamina, you can head down to Flamengo Park to visit the monument built in memory of all those who died in the Second World War, including the Brazilians who fought alongside the Allies in the Italian campaign. 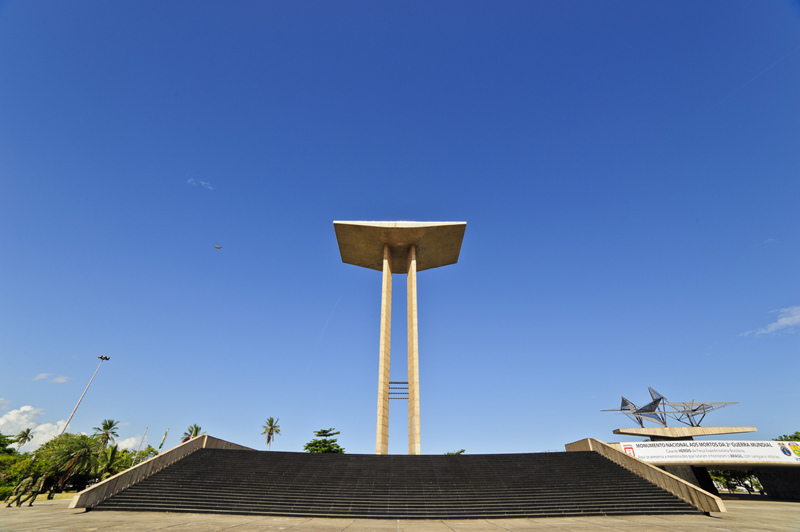 The monument houses a small museum depicting Brazil’s participation in the War. 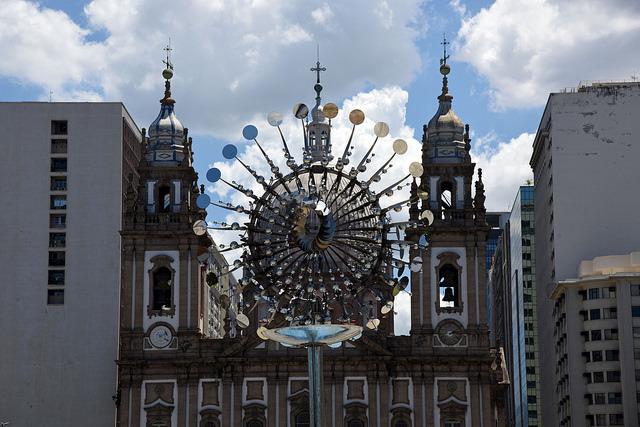 The monument, which can be seen throughout the length of Avenida Rio Branco, represents two arms raised with the hands “outstretched, beseeching God in prayer”. Since its inauguration in 1960, the monument has been visited by most visiting dignitaries, including Pope John Paul II who celebrated mass from its steps in 1980 to a crowd estimated to be more than two million people. 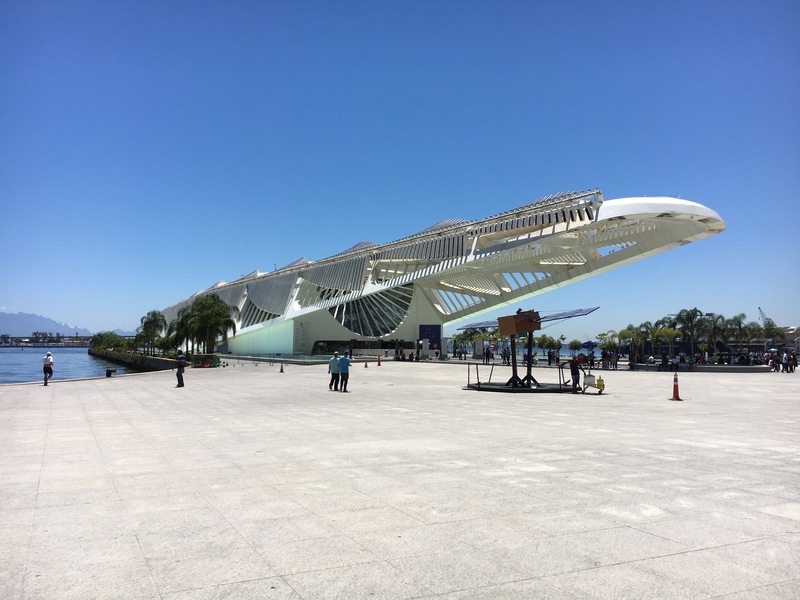 Just beyond the War Memorial is Rio’s Modern Art Museum and beyond that Santos Dumont Airport and the excellent National History Museum.